They may be some of the world's best jockeys, battling for one of the great jockeys' prizes in the racing world, but none were brave enough to predict victory in what looks like a hugely competitive renewal of the spectacular LONGINES International Jockeys Championship at Happy Valley on Wednesday Dec. 5. Javier Castellano finished plum last on his only previous IJC experience back in 2006 but the US-based star has experienced a quite fantastic 2018, including passing the 5,000 winner mark, and riding two Breeders' Cup winners at Churchill Downs in November. If those words translate into victory, Castellano would become the first ever US-based jockey to win the IJC. Zac Purton heads the Hong Kong Jockeys' Championship again after his thrilling victory over Joao Moreira to reclaim the premiership last season. The Aussie riding hero also won the IJC on this day last year despite being an outsider. For his part, Bowman – who won the IJC in 2016 – was more buoyant than Purton at Tuesday's (4 December) press conference. “I've drawn some decent horses and I'm feeling more confident than this time last year,” he said. “I've worked very hard these past couple of seasons and I hope I can do my supporters justice on Wednesday,” he said. The winner's cheque is a cool HK$500,000 (US$64,065.70) but Ho, Hong Kong's leading home-grown rider this term, was coy about what he might do with that reward should he accrue the most points from Wednesday's four-race contest. “I haven't really checked how big the cheque is!” he said. Hong Kong's high-flying Mauritian Karis Teetan will take his place, as will Silvestre de Sousa, British champion jockey for a third time this year and also currently based in Hong Kong. Others in the stellar line-up, Bowman and Purton among them, have experienced the thrill of winning this championship event. Also on the illustrious honour roll is Ryan Moore, a two-time winner; iconic Japanese ace Yutaka Take; and Christophe Lemaire, Japan's champion jockey. 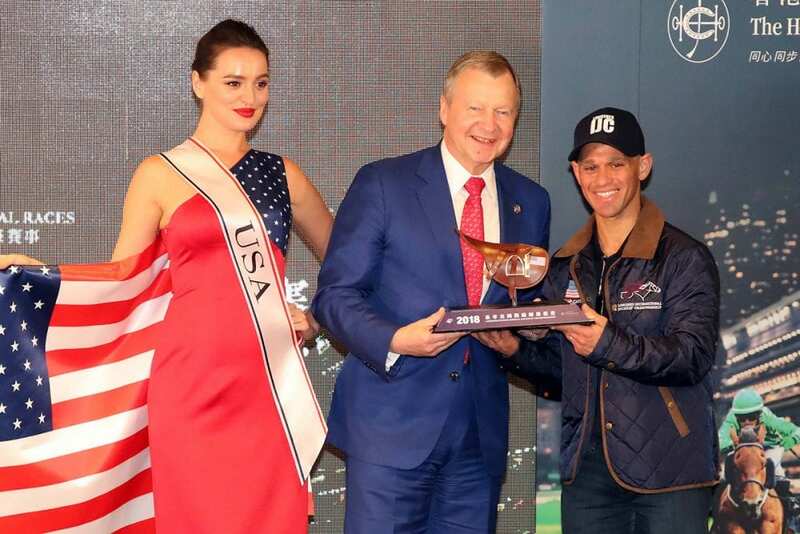 This entry was posted in NL Article, People and tagged happy valley, hong kong, hong kong jockeys' championship, hugh bowman, international jockeys' championship, Javier Castellano, joao moreira, longines, vincent ho, zac purton by Hong Kong Jockey Club. Bookmark the permalink.